Today,all the users who use Google as their Browser's Home Page must be delighted to see this fun-filled and joyful Doodle reading as-"Google's 13th Birthday" . Really this is a very important event in the Internet world and Google had to design a Doodle. This time today, it is for Google itself ! Google has been famous for making symbolically beautiful and cool Doodles (Google's logo redesigned to reflect and mark the importance of the event being celebrated in a symbolic way) logos and animated pictures for celebrating important events in the global history as well as for legendary artists, scientists,personalities, holidays, important figures around the world! 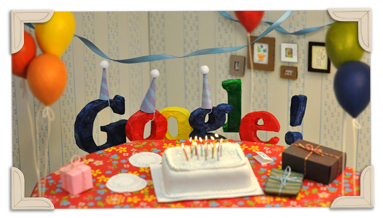 Today, on 27th September 2011, Google has got a very special occasion to design its Home Page with delightful, pleasant, and beautiful looking Doodle ( Google Doodle, actually) for its billions of Internet users (in the form of fans, lovers, partners) worldwide !